Down to 202 pounds today (happy). 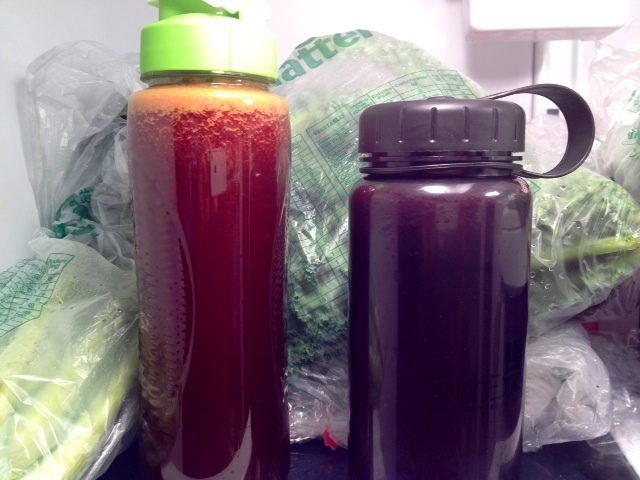 After hitting the gym this morning, I made my juices for the day … lots of kale, collards, spinach, celery, a big ol’ beet for the first time, cucumber, apple, lemon, and ginger (always ginger!). The weather here in NC is nasty hot today … I’m glad we worked out early in the day … now we can relax and enjoy the day with a good e-book, maybe some Wimbledon (go Roddick! ), and chilled juices over ice. Beets are awesome. No question about it. Not only do they add a gorgeous splash of color to any meal or juice, they add a whole lot of nutrients to our bodies! Loaded with folic acid, manganese, potassium, and iron, it’s no wonder that beets can help treat anemia, inflammation, circulation, and kidney stones. Beets are also loaded with fiber, which means they are fantastic for aiding in and eliminating constipation and help out the large intestine. Since Mother Nature knows what she’s doing, beets and carrots together are said to help balance hormones. With all of that, how could beets do even more for our health? Well, a study conducted by scientists at Wake Forest University in North Carolina, suggests Dementia could be preventable with a daily drink of beet juice! And lets not forget, beets, as well as spinach, celery and other leafy greens, are packed with nitrates which help increase blood flow, particularly in areas of the body that need more oxygen. Beet Bonus: Beet greens taste similar to chard and contain even more nutrients than the beet’s root, with lots of calcium, iron, and vitamins A and C.
I told you beets were awesome!